Plasma Etch, Inc., a leader in plasma treatment, will be providing live demonstrations of the company’s popular PE-50 plasma asher at SEMICON West. The demonstrations will be performed at booth number 5872. This is a great opportunity for manufacturers to get their hands on a working PE-50 plasma asher. Company representatives will be on hand to answer questions and provide live demonstrations. Members of the public are encouraged to bring a sample along with them to be cleaned at the show. The PE-50 is an affordable, entry level option for most types of plasma treatment. The system is popular for small production facilities, research labs, universities, and startup manufacturers in need of a small-scale, cost-effective plasma etching solution. Plasma Etch credits the PE-50’s success to its versatility and robust design. 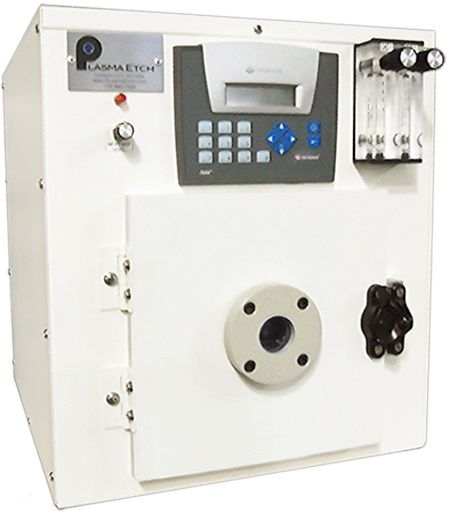 The system includes industry leading features such as an oxygen safe vacuum pump and the ability to run two gases simultaneously. The PE-50 features simple controls and easy to read indicators for monitoring the plasma etching sequence. Plasma Etch has been a leading manufacturer and industry innovator since 1980. The company holds several patents for the invention, development, and manufacturing of groundbreaking innovations, paving the way for plasma technology and the enhancement of quality manufacturing worldwide. Plasma Etch specializes in plasma cleaning and etching solutions of all sizes. Their products are industry proven, and set the standard for reliability, speed, and uniformity in plasma processing.